I walked into this one with only one expectation. That the love I once held for very ripe, rich, alcohol-laden, heavily-oaked shiraz from McLaren Vale had probably faded, or at best been superseded by far more fashionable drinking trends. Two things happened. I realised I was right. And I realised I was wrong. The colour is just shy of inky black and a swirl of the glass showed she was pretty viscous. Chocolate filled the air on opening, or to be precise – oaky chocolate. Sweet new oak. Caramel fudgy chocolatey oaky chocolateness. And pencilly oak too. You get the picture, but this wine smelled like new clothes, new furniture and new car all rolled into one. The fruit spectrum ranges from the dark spicy plum pudding to intensely aromatic bay leaf, cardamom, star anise, cassis and blackberry. It’s tarry and charry. There’s marzipan and cherry ripe too, and some gorgeous vanilla pod. So much primary fruitiness going on here for a wine of its age. And the peppery character often associated with this variety . It wasn’t completely clean or flawless – I detected a little VA plus a slight burnt toast character, which may have been a sulphide issue, but nothing to get too excited about. Finally, I have to say the alcohol was evident, yet it seemed perfectly at ease in the balance of things and I don’t think it looked in any way excessive. The palate was like an extension of the nose – an ethereal seamlessness ran from one to the other. By the time the wine reached my open gob I was still heady from the aromas of the bouquet and it all melded into one, filling my senses with bold, rich, juicy shiraz. Flavours? Plum and raisins, and oak(! ), sweet blackberry and mocha; black cherry chocolate. Texture? Velvety fine tannins, supple, smooth, long. Despite all of the above, I couldn’t call this wine ‘heavy’ – there was some (dare I say it) elegance to all the richness, and even (No!) some restraint. It finished warm, unsurprisingly, yet I still didn’t think the wine looked overly alcoholic. And then finally I checked the back label and saw ‘Alc: 16%’. What the...? A classic style, beautifully made in yesterday’s mould. I am right to say I have moved beyond these styles of wine, rarely drink them, and am no longer titillated by them. But I am wrong to say my love for them has faded. I am nostalgic for them and appreciate the style, commitment and artistry. And on the odd occasion I get to spill one into a glass I’m reminded of a time of great learning and development on my way to becoming a fully-fledged boorish wine berk. As I drank this wine I saw all the elements in balance, all the buttons pushed, all the boxes ticked – and the world stood, for a moment, in harmony. (I probably cracked this wine a little earlier than I should have, but I do prefer wines on the upward drinking escalator as opposed to the downward. I reckon this is drinking smashingly well and if you enjoy your bigger reds a little fresher with primary characters still to the fore, then get into one now). Value: Purchased via mail order at $50/bottle. 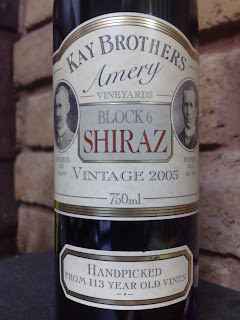 The Block 6 wines were extremely good value in the ‘90’s yet have increased rapidly with demand. I still think this is a pretty good value wine in the scheme if things. I can think of many other equally priced wines that may not be so worthy. 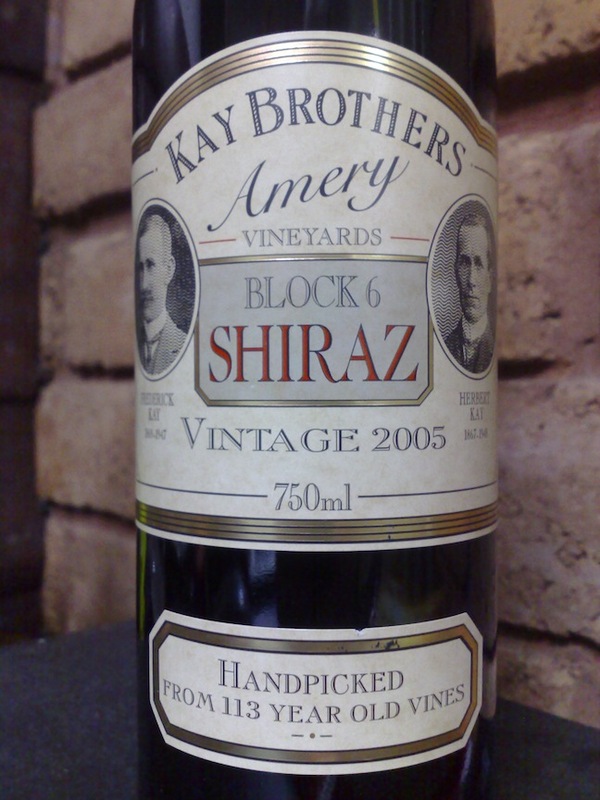 Producer: Kay Brothers Wines – www.kaybrothersamerywines.com – established 1890, family-owned. This wine is the flagship of the company and the fruit from estate-grown 100+ year vines. Vintage: A good year in the Vale. Plenty of winter rains, an even ripening season, a short/hot vintage and high sugars (therefore alcohols).